Colostrum has many beneficial effects on newborns due to its main compounds(proteins, fats, lactose, essential fatty acids, amino acids) as well asprotective antibodies that confer to the body. The buffaloes are the secondimportant species for milk production in the world after cows. The importance ofthe species is also conferred by a longer longevity, high dry content of milk anda strong organic resistance when compared with cows. The purpose of this study wasto investigate the changes of buffalo colostrum compounds such as fatty acids,cholesterol and physicochemical parameters during the first seven dayspostpartum and under the impact of the season, summer on pasture andwinter on dry diet (hay based). Fat from colostrum differs depending on the postpartum day showing meanvalues of 11.31-7.56% (summer season) and 11.22-7.51% (winter season). Thesevalues gradually decreased starting with first day postpartum until dayseven. Dry substance and protein presented a similar evolution to fat reaching thelowest values at the end of the colostral period. Lactose, ash and pH showed agradually increase reaching the maximum on day seven postpartum. Thehighest titres of fatty acids from colostrum are: butyric acid (C4:0), myristicacid (C14:0), palmitic acid (C16:0), oleic acid (C18:1) and the lowest valuesshowed up in myristoleic acid (C14:1), cis-10-pentadecanoic acid (C15:1),pentadecylic acid (C15:0) and margaric acid (C17:0) for both seasons. Higherconcentrations have been recorded for the summer season in general. Cholesterolconcentration decreased from 12.93 and 12.68 mg/100 mL (summer and winter season)to 9.02 and 7.88 mg/100 mL in the end of the colostral period. Physicochemical compounds of buffalo colostrum were influenced by season andpostpartum day of milking. Excepting lactose all other parametersgradually decreased during colostral period. Fatty acids and cholesterol showedthe same evolution, presenting higher values for the summer season. Specificfeeding in the summer season (on pasture) did lead in more concentrated colostrumin dry substance, fatty acids and cholesterol. Colostrum is the first food for mammalian newborns during the first days of life. Thecomposition of this liquid secreted and stored in the mammary gland in the first daysafter parturition is of great importance due to its physicochemical properties and itsimmunoprotective role in the early days of the calf . Colostrogenesis, the transfer of immunoglobulines (Ig) from maternalcirculation to mammary secretions, begins 3–4 weeks before parturition underendocrine control. Colostrum is critical for the survival of ruminant neonates sincematernal antibodies are not transported across the placenta . Colostrum is considered vital for normal growth and development of thecalves  and it is also a protecting agent against various diseases [4–6]. Colostrum contains major nutrients (fatty acids, proteins, carbohydrates), vitamins (A,B6, B12, C etc. ), minerals (Ca, Na, Mg, P, Cl, K etc. ), immunological compounds(immunoglobulines – IgG, IgA and IgM) [5, 7], hormones and enzymes [7, 8]. Besides providing immune support, colostrum has remarkable musculoskeletalrepair and growth capabilities. In addition, it seems that colostrum is the only naturalsource of four major growth factors namely transforming growth factors alpha(TGF-α) and beta (TGF-β), and insulin-like growth factors 1 (IGF-1) and 2(IGF-2) . The main parameters which are ordinary determined in almost every cow and/or buffalofarm are: fat, protein, lactose, total solids, ash and pH. The buffalo diet seems tohave a major role in colostrum composition , but also the lactation, age, season, state of health, breed and geneticinput of the parents [11–14]. Although colostrum is theoretically exclusively used for calves’ nutrition, thevariation of its main compounds might provide useful information on the optimal lengthof colostral feeding of newborns. New insights on colostrum usage could aim the milkingof extra-quantities that are not needed anymore for calves once the immunologicaleffects are fulfilled. The usual colostral period for calves is 3–5 days, althoughIg absorption ends in the first 36 h postpartum. Nevertheless, colostrum is avaluable source of other compounds for the newborn animal, such as proteins, fat,vitamins etc. Otherwise, we have to take in consideration colostrum supplements orcolostrum replacers. Hence, bovine colostrum might be used as important source of fattyacids and other compounds in human diet. The total lipids from buffalo milk are in a higher content  compared with cow milk but there are still missing studies on fatty acids(FA) from buffalo raw milk and even less from colostrum. Lipids contribute to sensorialand nutritional quality improvement of various products (mostly various types of cheese)and provide many benefits to human health, one of the most important being ananticarcinogenic agent . Bovine milk fat contains approximately 400 different fatty acids, which makes it themost complex of all natural fats . Fatty acids are an important nutrient , growth factor and involved in immune system fitness . Fatty acids play an essential role in metabolism, providing the cell aconcentrated source of energy and are implemented in the cell wall structure . Some of relatively obscure fatty acids play a crucial role in growth anddevelopment . Several fatty acids have beneficial effects on human health: butyric acid (C4:0) incancer prevention [16, 22]; medium-chain saturated and long-chain unsaturated fatty acids were allantiviral at different concentrations ; very long chain poly-unsaturated fatty acids of the n-3 family (e.g.,eicosapentaenoic acids (C20:5n-3) and docosahexaenoic acids (C22:5n-3)) have aninhibiting effect on tumor development ; lauric acid (C12:0) may act as an antimicrobial agent . Saturated fatty acids (SFA’s) in general should not exceed 10% of thetotal fat intake in human nutrition , because of negative aspects such as an increase in low-density lipoproteincholesterol (LDL-C) and further the risk of coronary heart diseases . The adults of ruminants (cows, buffaloes, sheep, goats and camels) cansynthesize volatile fatty acids (VFA): acetic (C2:0), propionic (C3:0) and butyric(C4:0) acids in their rumen . Diet, the effect of breed, evolution of lactation and variation between individuals arethe major factors influencing fatty acid concentration in milk . Seasonal variation of fatty acids content might provide useful informationfor the optimal harvesting period during the year in relation to the highestconcentration of those fatty acids. Nutritional and metabolic effects of highlyconcentrated fatty acids in colostrum might generate large benefits in calves but evenhumans. The use of extra-quantity (the amount of colostrum secreted after the first3–5 days) of fatty acid rich colostrum in human nutrition supplementation shouldnot be neglected. Cholesterol is an important compound in milk and acts as a critical component of cellmembranes, the precursor of all steroid hormones, a precursor of vitamin D, and thelimiting factor that brain cells need to make connections with one another calledsynapses, making it essential for learning and memory . Its concentration is low (0.5% from the total lipids in human milk – [31, 32] but higher in the first days of lactation – colostral period. Both,fatty acids and cholesterol concentrations in colostrum greatly vary depending on thespecies [33–36]. In the literature, there are studies on colostrum from cows, but there are no or poorstudies on colostrum from buffaloes, which is in some countries as India, Pakistan andChina the second most important species in milk production. One of the most interestingaspects concerning the nutrition of ruminant calfs in the first weeks of life is thenon-functionality of specific ruminal digestion. Only the real stomach –abomasum – is active and therefore the direct intake of allnutritional compounds is demanded. The purpose of this study was to determine the evolution of main physical and chemicalcompounds of buffalo colostrum as well as fatty acids (10 saturated, fivemono-unsaturated fatty acids (MUFAs) and one poly-unsaturated fatty acid (PUFA)) andcholesterol within the first seven days postpartum depending on the season(pasture vs. dry diet). Although buffalo colostrum has been mainly studied forits immunological aspect given by immunoglobulin content [5, 15], the nutritional and quality of the main nutritional compounds aspect cannotbe neglected. Comparing the main physicochemical parameters of buffalo colostrum from the summerand winter season a significantly increased titer in the summer season has beendetected for most of them (Table 1, Additional file1: Tables S1, S2). The overall trend during the firstseven days is a rapid decrease of the main physicochemical colostrum parameters untilday four; thereafter the slope is still decreasing, but negligible. This observationwas similar for total solids, fat, and protein. In contrast is lactose, whichconstantly increased up to day four, followed by a slightly stagnation of the titerfor the next three days. The same ascending trend for lactose and descending forprotein and fat was reported by  for Egyptian buffalo colostrum in the first days after calving. Ingeneral, there seems to be no major difference in changes of the basic nutritionparameters between buffalos and cows. In Holstein cows the same general changes weremeasured . In fact, the lactose concentration from colostrum still increases afterthe colostral period, reaching the highest values in regular milk . It seems that energy given by lactose is more important in the first daysof life and even for newborns than the fat and proteins, which is not surprisingbecause carbohydrates show the highest respiratory quotient following proteins andfat. Analysis of variance for each compound between and within each season showedhighly significant differences between days and seasons (Friedman ANOVA, P< 0.001, Additional file 1: Table S1 and WilcoxonMatched Pairs Test, P < 0.0001, Additional file 1: Table S2). The lower values for the winter season might be explainedby various reasons ranging from lower feeding level in high quality protein andenergy, and rate of metabolic energy conversion. In contrast, pasture iswell-balanced in the main nutritional compounds and has a higher conversion rate,conversely doubled by optimal climatic factors in the summer season. (All values are mean±SD and expressed in %; n = 4). Consequently, the summer born calves have an advantage in a more concentratedcolostrum feeding. Similar seasonal variation of basic parameters from colostrumoccurred also in cows . Compared to regular milk, colostrum has at least 40% more dry matter (incows and buffaloes ; in buffaloes ; in sheep ). This rich milk could thus provide higher amounts of fats and proteins totheir progenies and even human consumption. Our results are in accordance with those reported by  which measured the same parameters to the same breed and exceed the datareported by  (which used buffalo breeds from Pakistan). Here, we determined sixteen fatty acids from buffalo colostrum, including onevolatile fatty acid (butyric acid). The variation in fatty acid concentrations showeda significant descendent trend (Friedman ANOVA, P < 0.001) during thefirst seven days of lactation (Table 2, Additional file1: Table S3). All colostrum fatty acids decreased byapproximate 15-20% from the first to the seventh day, independent of the season,excepting palmitoleic acid (C16:1) which decreases rapidly until day four and furthera slightly descend plateau was detected. The summer colostrum showed a much higherconcentration for all studied fatty acids in relation to winter colostrum (WilcoxonMatched Pairs Test, P < 0.0001, Additional file 1: Table S4). A comparison of saturated fatty acids (SFA),mono-unsaturated fatty acids (MUFA) and poly-unsaturated fatty acids (PUFA) for thetwo seasons evidenced a higher variation of saturated fatty acids compared withothers. Seasonal variation also occurred in a comparative study on buffalo, cow, goatand sheep milk where the pasture season has shown a higher concentration of totalpoly-unsaturated (4-35%), trans- (16-35%) and conjugated linoleic acid contents(24-48%), while short fatty acids (< 14:0) showed an opposite effect . It seems that naturally grown fresh grass during summer affects thebio-hydrogenation pathways . In the colostral period the same physiological pathways seem to bepresent, reaching a higher concentrated fatty acid diet for calves. The metabolicneeds in fatty acids of buffalo calves in the first days of life are unknown and acorrelation with fatty acid titers in colostrum is impossible. However, it is thefact that in the first days of life the buffalo newborns only have one of thestomachs’ compartment active (abomasum) and direct feeding with theindispensable nutrients such as proteins (amino acids), fats (fatty acids andcholesterol), energy (lactose and lipids), vitamins and immunoglobulin isdemanded. (All values are mean±SD; n = 3). Cholesterol levels in buffalo colostrum are also higher in the summer season(9.02-12.93 mg/100 mL) when compared with the winter season (7.88-12.68 mg/100 mL)(Table 2). Daily variation, starting with the first dayafter calving until day seven, showed a rapid decrease of cholesterol (FriedmanANOVA, P < 0.001) (Additional file 1: Table S3)down to 67% (average for summer and winter) in buffalo colostrum. Not only dailychanges were observed but also the seasonal variation is quite high (P =0.0001). In the summer season the concentration of cholesterol in colostrum decreasedgradually and relatively constant down to day six and an abrupt decrease in dayseven. In the winter season the downward trend is more emphasised, at least startingwith day five. The overall decrease is even bigger than in the summer season(Wilcoxon Matched Pairs Test, P < 0.001) (Additional file 1: Table S4), with a maximum of 63% at day seven. Even after thecolostral period the cholesterol concentration decreased constantly in mares . The rapid decrease of cholesterol concentrations starting with day fivemight be an indicator of the colostral period length. The colostral period has usually considered not covering more than three days, moreimportant is immediate administration of colostrum to newborns and also the qualityof colostrum . Calves were usually fed by their mothers within the first seven days andjust thereafter the milking period started. There is a second option to milk the richmilk from day four to day seven and use it for further purposes such as humanalimentation. New approaches and understanding of cholesterol metabolism , and comparative studies on animal vs. industrial sources offatty acids and cholesterol in human health , could clarify the importance of animals being sources of fatty acids andcholesterol in human nutrition. Some fatty acids and cholesterol from buffalo colostrum are significantly influenced bythe season and were characterized by a high variability during the first seven dayspostpartum. All studied buffaloes showed the highest concentrations of fattyacids and cholesterol in the first five days of the colostral period, thereafter theygradually decreased, reaching normal parameters of buffalo milk at day seven. Higherconcentrations of fatty acids and cholesterol during the summer season possibly havebeen influenced by pasture nutrition. Newborn calves born in summer could thus have morenutritional benefits and therefore a faster development comparing with winter ones. Thebuffaloes can be milked starting with day four as the calves already benefits bysufficient amount of colostrum and the surplus of this ‘rich’ milk till dayseven could easily be used for human nutrition. The main physicochemical parameters alsodiffered from summer to winter. Lactose was the only compound of buffalo colostrum whichconstantly increased during the first seven days of milking. Buffaloes selected for this study belonged to the Romanian buffalo breed, originatedfrom the water buffalo. The experimental plots have been achieved from theexperimental farm TNP Meşendorf, Braşov county, Romania. Each plot had 5animals in successive lactations (third and fourth lactation). All animals have beenfed ad libitum during the summer on pasture while in the winter season theywere fed with hay and concentrates (cereals). Colostrum samples were individually collected in the first seven dayspostpartum. The milk was collected in sterile containers and the milkingwas done manually. Samples for colostrum physicochemical analyses were immediatelyanalyzed from fresh colostrum. Samples used for fatty acid and cholesterol analyseswere kept at −20°C until analysis. The main physicochemical parameters have been determined with the milk analyzerLactoStar 3510 (Funke Gerber). Ash content was obtained following the method given inAOAC (2000) , while pH of raw milk was determined with a HI991300 pH meter from Hannainstruments at room temperature. Total lipids were extracted using a modified Folch procedure  as described by Kraft et al., 2003 . Briefly, 10 mL sample was used for extraction with 90 mL of achloroform-methanol solution (2:1 v/v). Afterwards 30 mL of distilled water wereadded on top of the extract, into a separation funnel. After the separation of thetwo phases, the aqueous layer was discarded. The chloroformic fraction was furtheranhydrified using anhydrous sodium sulphate. The extracts were reduced nearly todryness using a vacuum rotary evaporator at 35°C. Fatty acids were convertedto methyl esters by reaction with boron trifluoride/methanol at 80°C for twohours in a closed Pyrex glass tube. Afterwards the sample was placed into aseparation funnel were the esters were extracted using 10 mL hexane three times.The collected hexanic fractions were dried using anhydrous sodium sulphate,filtered, concentrated under a nitrogen stream and finally re-eluted in 1 mLhexane. Non-adecanoic acid (19:0) was used as internal standard for quantificationpurposes, which was added in each sample before the transesterification step. Inorder to identify the peaks, a FAME mix (Supelco® 37 Component FAME Mix) wasinjected prior to sample analysis. Fatty acids were analyzed by means of gas chromatography (GC) with flameionization detection (FID) . 1 μL sample was injected into the Shimadzu GC-17A series gaschromatograph, equipped with a 30 m polyethylene glycol coated column (AlltechAT-WAX, 0.25 mm I.D., 0.25 μm film thickness). Helium was used as carrier gasat a pressure of 147 kPa. For the oven temperature the following program was used:70°C for 2 min then raised to 150°C at 10°C/min rate and held at150°C for 3 min, then further raised up to 235°C at 4°C/min. Theinjector and detector temperatures were set at 260°C. 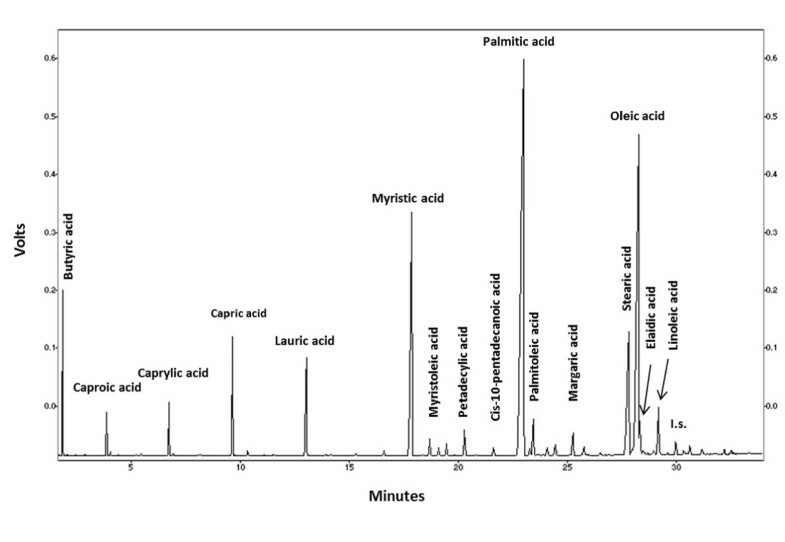 The GC chromatogram forbuffalo colostrum depicting fatty acids distribution is shown in Figure 1. Typical GC chromatogram of 16 fatty acids in buffalo colostrum. C4:0(Butyric acid), C6:0 (Caproic acid), C8:0 (Caprylic acid), C10:0 (Capricacid), C12:0 (Lauric acid), C14:0 (Myristic acid), C14:1 (Myristoleic acid),C15:0 (Pentadecylic acid), C15:1 (Cis-10-pentadecanoic acid), C16:0(Palmitic acid), C16:1 (Palmitoleic acid), C17:0 (Margaric acid), C18:0(Stearic acid), C18:1 (Oleic acid), C18:1 iso (Elaidic acid), C18:2(Linoleic acid); I.s. – C19:0 (Non-adecylic acid – used asinternal standard). The content of cholesterol was determined in accordance with a modified proceduredescribed by Borkovcová et al., 2009 . Briefly, a solution of 10 mol/L potassium hydroxide (9:1) was added to10 mL of each sample and refluxed for 30 minutes. 5 mL deionized water and 10 mLn-hexane were added after cooling down to room temperature and the sample wasintensively shaken for 20 minutes. The organic layer was retained and furtherwashed with deionized water until neutral reaction and dried with sodium sulphate.The sample was reduced nearly to dryness using a vacuum rotary evaporator andre-dissolved in 1 mL acetonitrile-methanol (70:30 v/v). Quantification by HPLC wascarried out using a Shimadzu VP Series liquid chromatograph system equipped withtwo delivery pumps and a UV–VIS detector at 210 nm. The chromatographicseparation was carried out on an Alltima RP C-18 column (250 × 4.6 mm, 5μm, Alltech Associates Inc.). Isocratic elution with a mobile phase ofacetonitrile and isopropanol (70:30) mixture at a flow rate of 1 mL/min was used.Column temperature was set at 35°C and injection volume was 20 μL. Anexternal calibration was performed prior to the analyses of the dairy products.The calibration curve was made with cholesterol concentrations ranging from 0.2 to2 mg/mL (6 data points). The linear correlation between the cholesterol peak areaand its concentration was satisfactory (r 2 = 0.999).Recovery tests, detection and quantification values for this method are shown inAdditional file 1: Table S5. A typical chromatogram forcholesterol found in buffalo colostrum is presented in Figure 2. 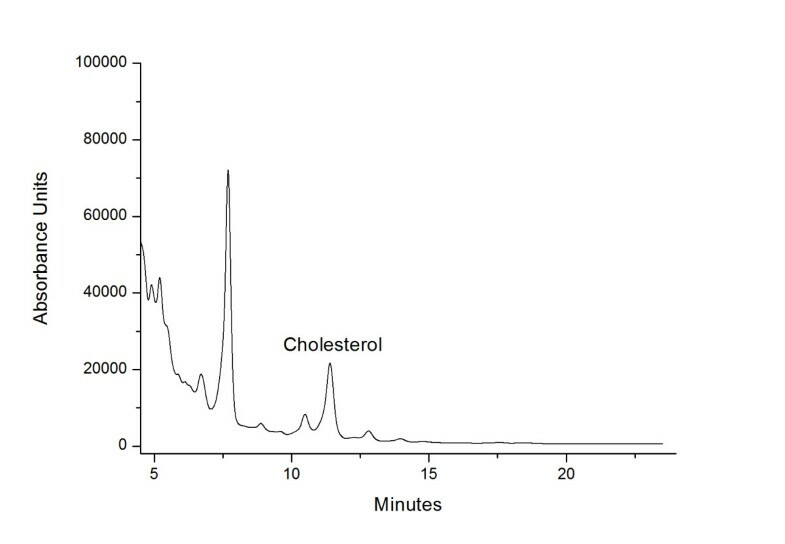 HPLC chromatogram from a buffalo colostrum sample detected at 210 nm. Values were expressed as mean and standard deviation (SD) for all studied parameters.All statistical analyses were done using standard spreadsheet software and STATISTICA8.0 (StatSoft, Tulsa, Oklahoma, USA). Level of statistical significance was definedas P < 0.05. This study was financially supported by CNCSIS–UEFISCDI, project numberPNII–TE, 108, code 258/2010 (Director: Aurelia Coroian). AC, COC, SE contributed equally to the experiment; the statistical interpretation of thedata and preparation of the manuscript. CB, CTM optimized the protocols for fatty acidand cholesterol analyses and collection of data. VM, CR contributed equally tophysicochemical analyses of colostrum samples. All authors approved the final form ofthe manuscript.